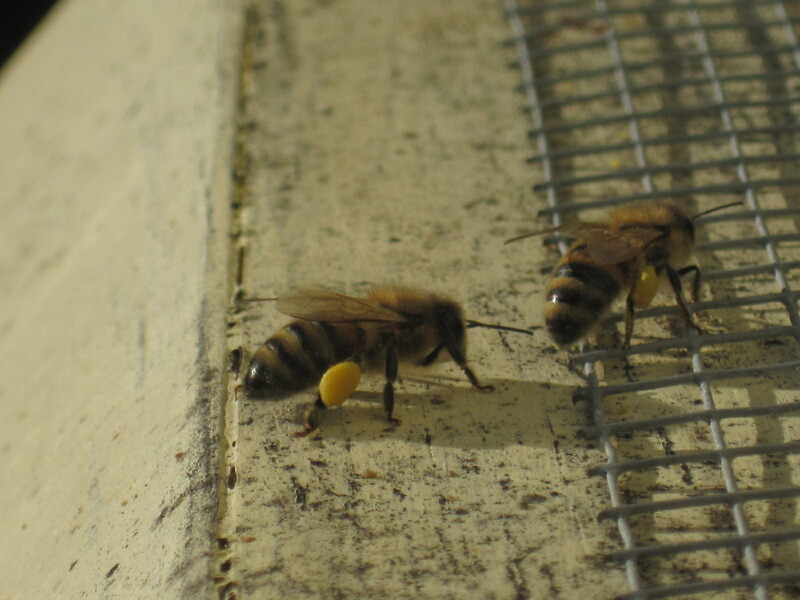 I was lucky enough to get away from my indoor responsibilities long enough to visit a few of my hives today and was delighted to find the bees bringing in pollen! I can only guess that it’s coming from the filberts, not having had much opportunity to be outside this week. What’s blooming where you are? Color could be the key to what they may have been bring in. I know here that filberts and cedar are both a pale or light yellow in color. If may bees are able to get out I may be able to ID the pollen. Follow-up: Heather is also in bloom here, the snow and cold had set it back but it has recovered quite well and has lots of new blooms, not sure on color but when weather allows I will try to find out. The pollen was definitely a nice clear yellow. I’m not sure we’ve got much heather out here (not a whole of of intentional landscaping in my neighborhood). I hadn’t thought to collect any pollen for the microscope. That’s a great idea!